The Glow-Up of the Year Award for 2016 officially goes to former Texas governor Rick Perry, who went from his second failed presidential campaign to Dancing with the Stars to being the new secretary of energy. Like most of the rest of Donald Trump’s Cabinet, Perry has a record for not being especially environmentally friendly. And there are plenty of Rick Perry quotes on climate change to show he won't protect the environment, even though it needs protecting now more than ever. The president-elect confirmed the selection in a statement Wednesday, praising Perry's experience regulating the Lone Star State's substantial energy-based economy. "As the Governor of Texas, Rick Perry created a business climate that produced millions of new jobs and lower energy prices in his state, and he will bring that same approach to our entire country as Secretary of Energy," read the statement. Clearly, Perry’s main job will be protecting the country’s financial interests as opposed to environmental ones. And based on what Perry’s said in the past about his thoughts on climate change, he won’t mind. These five quotes show that Perry isn’t that concerned, or even convinced, by the mountains of scientific data proving the existence of climate change. This fact alone makes him a particularly dangerous choice for secretary of energy. We cleaned up our air in the state of Texas, more than any other state in the nation during the decade," Perry claimed during a GOP debate in the 2012 cycle. "Nitrous oxide levels, down by 57 percent. Ozone levels down by 27 percent. That's the way you need to do it, not by some scientist somewhere saying, 'Here is what we think is happening out there.'" The science is not settled on this. The idea that we would put Americans’ economy at jeopardy based on scientific theory that’s not settled yet to me is just nonsense. Just because you have a group of scientists who stood up and said here is the fact. Galileo got outvoted for a spell. 3. Scientists Who Believe In Climate Change Are All In A "Secular Carbon Cult"
In his 2010 book Fed Up! Perry detailed his belief in a "secular carbon cult" of scientists who manipulate data to show evidence of climate change. "[Climate change is] all one contrived phony mess that is falling apart under its own weight," he wrote. "Al Gore is a prophet all right, a false prophet of a secular carbon cult, and now even moderate Democrats aren’t buying it." He took his claims about evil, money-grubbing scientists on the road in 2011 during his hilariously unsuccessful presidential run. "There are a substantial number of scientists who have manipulated data so that they will have dollars rolling into their projects," Perry said at a meeting with new Hampshire business leaders early on in the race. "Yes, our climates change. They’ve been changing ever since the earth was formed,” was one of Perry's cheekiest lines in his stump speech from the 2012 campaign season. While technically true, it disregards the matter at hand, which is that human activity is changing the climate and desperately needs to be regulated. 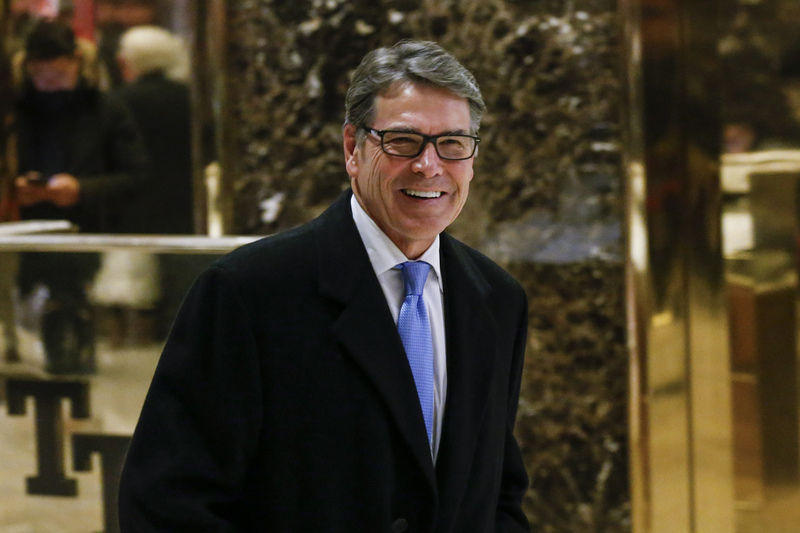 Sadly, Perry isn't even as scary a Cabinet choice as many of the others Trump has nominated. All the country can do now is protest, stay up-to-date, and hope that nothing too catastrophic happens in the next four years.